Approaching Salisbury on A354, head to the junction of A354 & A338. Cross the lights and take the second exit at the roundabout and continue on A338/New Harnham Rd. At New Bridge Roundabout, take the 3rd exit onto A338/Churchill Way South. At College Roundabout, take the 2nd exit onto A36/Southampton Road. 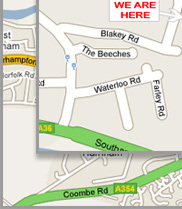 Take first left onto Tollgate Rd and take second right onto Blakey Rd. At the end of Blakey Road take the first left and JWR Vehicle Services is at the end of the road on the right. Approaching Salisbury on A338, head to the junction of A354 & A338, cross the lights and take the second exit at the roundabout and continue on A338/New Harnham Rd. 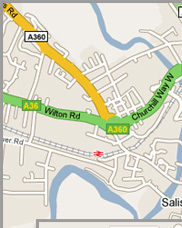 Approaching Salisbury on A36(West), take the 2nd exit on to Churchill Way West at St Paul's roundabout. (Approaching Salisbury from A360 take 1st exit). 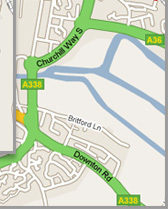 Take the 2nd exit at Castle roundabout on to Churchill Way North (Approaching Salisbury on A345, take 1st exit). Continue to St Mark's roundabout. 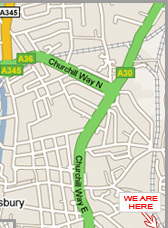 Take the fouth exit onto Churchil Way East (Approaching Salisbury from A30 take 2nd exit). At College Roundabout, take the 1st exit onto A36/Southampton Rd.